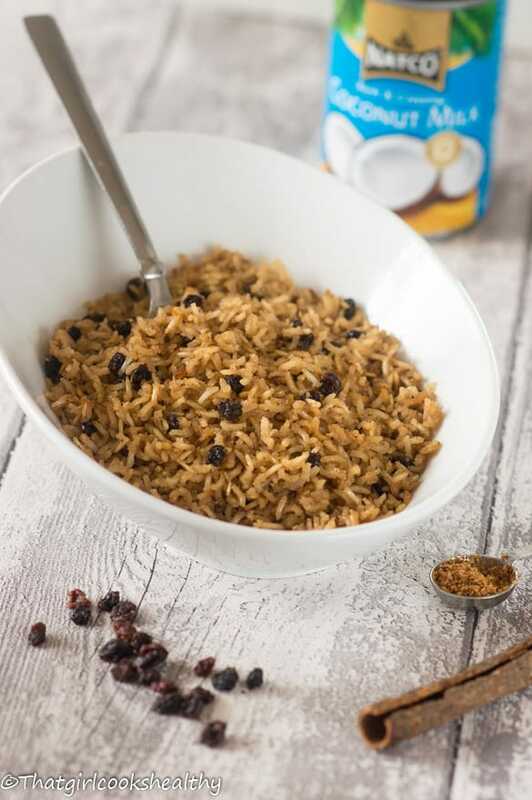 Arroz con coco receta – Bring a taste of Colombia to your home with this brown rice cooked in coconut with raisins, cinnamon stick and coconut sugar for low GI. 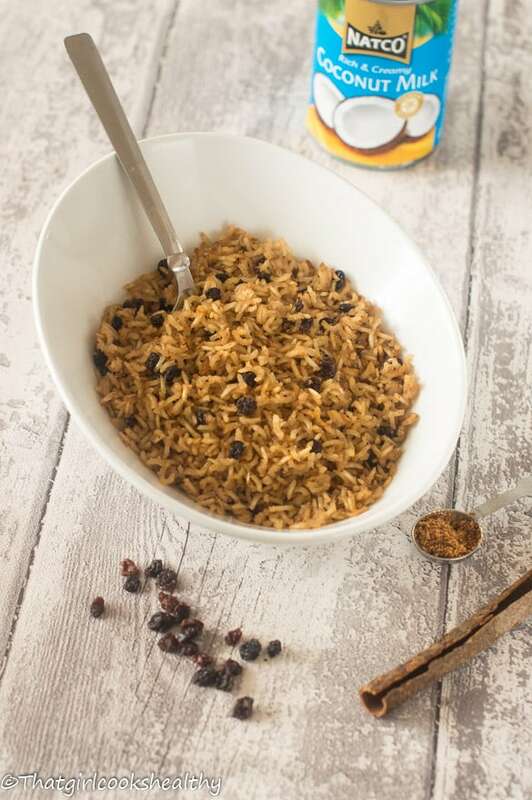 In the Caribbean rice is a absolute dietary staple, in fact what rice is to the Caribbean is what pasta is to the Italians. Although Colombia is not geographically located in the Caribbean. I feel this sweet and savoury one pot rice dish is definitely worth sharing. 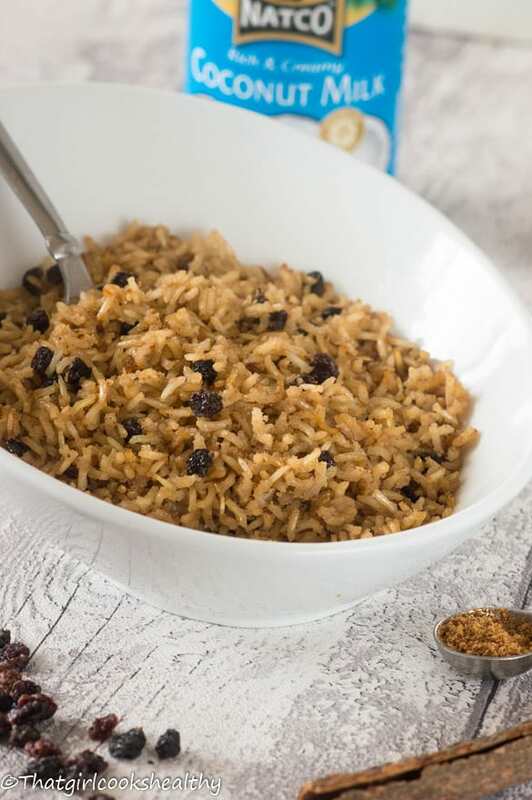 Arroz con coco essentially translates to a sweet coconut rice, a dish that derives from Colombia. This colombian rice dish is also known as Arroz con Coco titoté. Titoté is the coconut residue which is formed after the coconut milk has evaporated. For a second you may be forgiven to think the pictures deeply resemble Jamaican rice and peas due to the dark hue. Well the colour comes from caramelizing the coconut solids and the use of brown sugar, in my case I used coconut sugar which is diabetic friendly with a low glycemic index number (35). I used brown rice which is quite nutty and a million times healthier than white rice which has been chemically treated. 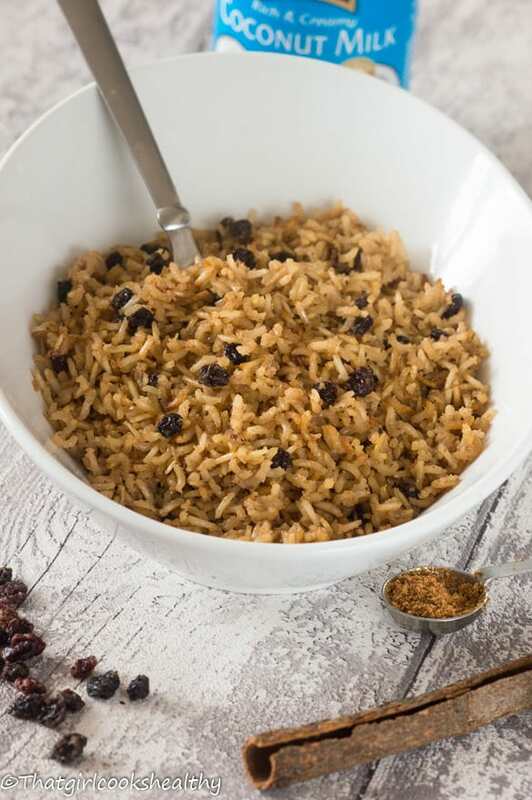 The key to softening brown rice is to soak it overnight or for several hours, this cuts down on the cooking time as the grains are softer to work with. Soaking rice is also a really great way to eliminate the starch which can be seen when rinsing rice. The water tends to be quite cloudy in appearance and takes a while to finally run clear. Coconut milk – Colombian use fresh coconut milk to make this recipe. For the benefit for accessibility I suggest using full fat canned coconut milk. Use the coconut solids only – the solids is the top half of the coconut milk that tends to be hard and separates when cold. When you open a can you need to scoop the solid off. The solids will serve has the foundation for the recipe. Forming the titoté – The solids needs to be broken down/caramelized which takes a bit of time and your patience. It takes roughly 10 minutes because you are working with the solids only and not the whole coconut milk. In my opinion this take it much easier to work with. In order to achieve this, once the solids are in the pan stir the mixture until the excess milk evaporates. Then you will be left with a very small amount of coconut almost like shreds and some oil, I personally skimmed off the oil as it can make the rice too oily, so do be mindful of that. Once the solids have caramelized, simply add the remaining ingredients. I added a cinnamon stick to the rice which adds a lovely warming note. The rice should take 45 minutes to cook, though check the liquids levels periodically to ensure the rice doesn’t burn. Serve with meat, vegetables or legumes for a vegan option. Heat the coconut solids in a heavy base saucepan or dutch pot and bring to a boil. Reduce heat to medium and stir the coconut solids until they separate from the oil. This should take roughly 10 minutes, the solids should be a beige colour, don’t worry if it’s not too dark. Skim off the excess oil in the pan and discard. 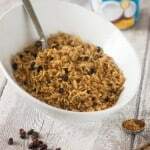 Add the rice to the pan and coat with the coconut followed by the pink salt, coconut sugar, raisins and cinnamon stick then stir. Pour in the coconut milk and stir again. Bring the milk to a boil, then reduce to simmer, covered, for about 45 minutes. During the given time check the liquid levels, if the rice isn’t cooked through and the liquid has evaporated add 1/4 cup at a time of more coconut milk. Once cooked, leave to stand, covered for 5 minutes before serving. I love your tip about soaking the rice overnight. Brown rice always gives me a little trouble, so I am absolutely going to try that. This looks delicious, and the cinnamon and coconut flavor in it sound divine! Thanks Tracey, I highly recommend soaking any whole grain rice, it cooks 10 times quicker. Yummmm, it sounds so sweet and delicious, the perfect treat for dessert. Love the gorgeous color from the caramelization and the subtle flavor from the cinnamon. Can’t wait to try! This looks very good! Thanks for the brown rice tip. Brown rice takes forever to cook. I will def try your tip next time. Thanks for sharing!